I saw this photo on pinterest and loved the idea but tweaked it just a little to simplify it some. and it was the one I was going to go with except I didn’t like the idea of throwing away the perfectly good (and already labeled) containers the screws come in just to have a bigger container in it’s place. But! 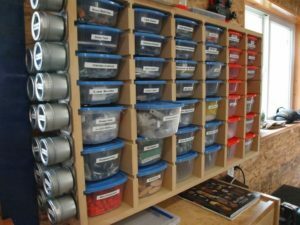 It is a good option to consider and you could use the same steps below and just skip my step about making shelves. As for mine….I built it from scraps so this one only holds 10 boxes, but I could easily make another one and put it either beside or under this one. : ) You can make yours as long as you want though; the same steps will apply. Actually, before we get started (just so I don’t have to keep inserting it) just note: a screw box is 3 1/2″ deep, 4 1/2″ wide, and 1 3/4″ tall. 1) I have a stack of 23″ long scrap pine 1xs in my shop from making growth chart rulers so I grabbed one and lined out my marks. I came in 1/4″ then made a mark every 2 1/4″ after that. I would first mark exactly where the 1/4″ mark fell (center markings below) but then also mark 1/8″ less (the left lines) and 1/8″ more (the right lines). I did this because I knew I was going to use 1/4″ material for the shelves and this would give me a better visual for cutting those slots. 2) I put my dado blades on my table saw (video tip here) and just cut where my lines were. It might be easier for you if you transfer your marks to the side of the wood but I just looked at my marks on the top then lined it up to the blade and pushed it through with my miter gauge. Note: If you aren’t familiar with dado blades, they are just blades that make cutting slots like these easier. If you don’t have a set then you can use either your table saw or circular saw. The blades width is 1/8″ so you would need to make a pass then line up your piece again to make a second pass. If you do it this way you need to make sure you don’t overlap the passes or your slot won’t be 1/4″ and your shelves won’t fit. 3) To make it to where I could easily grab the box I wanted to make the sides 2 1/2″ deep. I set the fence on my table saw and ripped two strips. By doing it this way the slots line up perfectly with their counter slot. 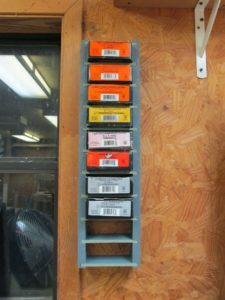 4) Next I cut 11 shelves that are 5 1/2″ x 2 1/2″. Note: The width of your shelves will be determined by how deep you make your dadeo cuts. To figure out the measurement you can put a box in between the two sides then measure from the end of the left slot to the end of the right. ….Eh. WilkerDon’t: While I was testing out my slots I actually ended up breaking those slim end pieces. …Yeah. I mightn’t yelled said a few unladylike words at that point. So learn from my lesson and be careful with those ends. Note: Instead of cutting and attaching a back piece, I made these pockets so I could attach the unit directly to my shop wall. If you don’t have a Kreg, or don’t like the design, then cut a back and that will allow you to either attach a hanger on the back or screw it in from the inside through the back. 6) Next I put in the two end shelves first then put in the rest. I used the rubber end of my hammer here to help it along. Since it’s such a snug fit I didn’t use wood glue. 7) Then I picked out a spot on my wall and put four screws in those pockets I made in step 5. So any time I need a box I can just grab whichever one I want and pull it out. Eh. But then this corner ruins it. : / Maybe next weekend I can get Cody to make room in his shop for his cubby hole thing so I can start on that corner and back wall. Be sure to subscribe if you’re interested in seeing what projects I come up with next! I hope everybody has a great week.